You can easily wire this breakout to any microcontroller, we'll be using an Arduino. For another kind of microcontroller, just make sure it has I2C, then port the API code. We strongly recommend using an Arduino to start though! The VL53L0X has a default I2C address of 0x29! 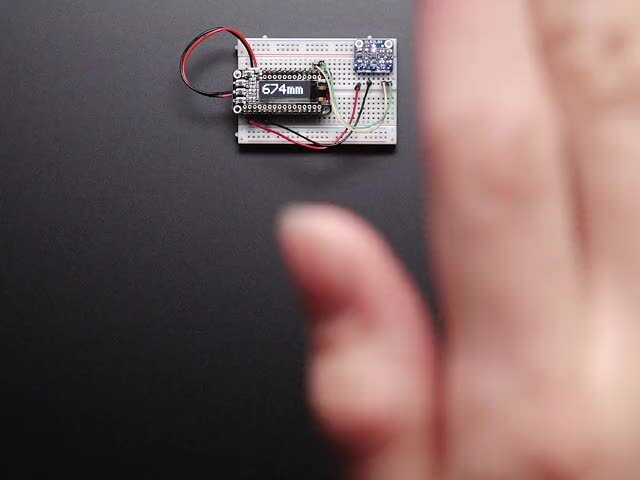 To begin reading sensor data, you will need to install the Adafruit_VL53L0X Library. Don't forget to remove the protective plastic cover from the sensor before using! I2C only allows one address-per-device so you have to make sure each I2C device has a unique address. The default address for the VL53L0X is 0x29 but you can change this in software. To set the new address you can do it one of two ways. During initialization, instead of calling lox.begin(), call lox.begin(0x30) to set the address to 0x30. Or you can, later, call lox.setAddress(0x30) at any time. Initialize sensor #1 with lox.begin(new_i2c_address) Pick any number but 0x29 and it must be under 0x7F. Going with 0x30 to 0x3F is probably OK.
Keep sensor #1 awake, and now bring sensor #2 out of reset by setting its XSHUT pin high. Repeat for each sensor, turning each one on, setting a unique address. Note you must do this every time you turn on the power, the addresses are not permanent! This guide was first published on Nov 23, 2016. It was last updated on Nov 23, 2016. This page (Arduino Code) was last updated on Apr 22, 2019.